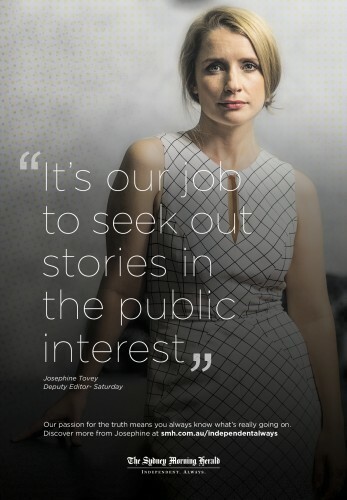 Fairfax Media’s The Sydney Morning Herald and The Age have launched a new brand campaign featuring several high profile journalists expressing their dedication to independent, quality journalism. The brand campaign will include print, cinema, outdoor, radio, digital and social media executions and a microsite featuring the journalists’ films at smh.com.au/independentalways and theage.com.au/independentalways. Other journalists featured in the first phase of the campaign include Peter FitzSimons, Caroline Wilson, Adele Ferguson, John Silvester, Terry Durack, Amber Robinson, Ardyn Bernoth, Anthony Dennis, Jo Tovey and Andrew Webster. Fairfax Media’s Australian publishing media director consumer marketing Vicki Aristidopoulos said: “Our readers are independent thinkers. They don’t want to be told what to think. They like to be presented with quality, balanced journalism that lets them make up their own minds about all the things that matter: big journalistic investigations, sport, food reviews, culture and art.